Marloes De Vries is now a member of the Ohh Deer greeting card family! 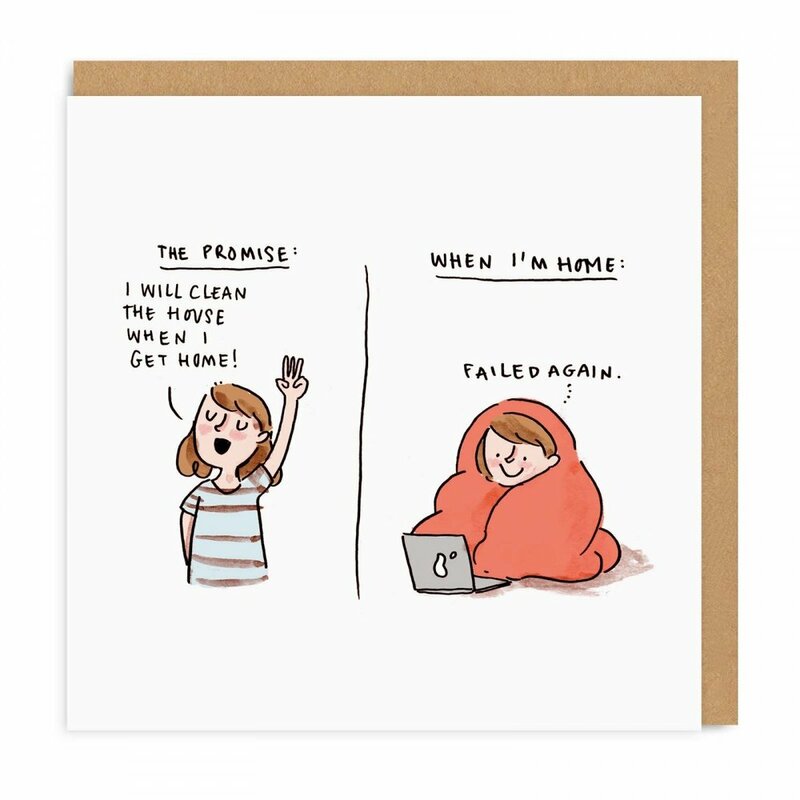 With 7 new cards featuring very relatable illustrations, we’re super excited to talk to Marloes about her career and the range. Marloes is based in the Netherlands and has been working in the creative industry for around 10 years! Producing work with clients such as Flow Magazine, TEDx and Ravensburger, her illustrations have gained mass popularity on social media. Get to know Marloes below! First things first, the usual background story! Could you give us a quick insight into your creative beginnings and how you got to be the illustration sensation you are today? That's very kind of you to say, that makes me blush! I started drawing at age 3 and according to my mum I was obsessed right away. I declared I was going to be an artist at age 4 or 5, so quite early on I had my path set out for me. When I was 7 or 8 years old, my older cousin said she wanted to go to art school and after explaining to me what art school was ("you get to draw all day!") I wanted to go there. It's strange looking back at it that I never changed my mind. I was so sure of this! I studied Visual Communication in art school focusing on graphic design as my teachers told me I couldn't draw very well. I worked as a graphic designer and art director after graduating. After a few years in the business I went freelance in graphic design and photography. About a year after that I tried getting into illustration, because in all honesty, that's what I wanted to do most. I've been a freelance illustrator and writer now for 8 years. I built up my own business mostly with the help of social media, using it to show people what I love to do and what I can do. Having worked full-time for a number of years and then taking the plunge into the world of freelance – how did you find the transition of going into self-employment? Were there any challenges that you found along the way? Oh yes, many! One of the things that scared me the most in going from a steady-paying job to going freelance was not knowing if you would get enough paid assignments to pay the bills. I think that will always be tricky. You have to keep presenting yourself every day to the world, show them you are here and ready to do some work. There are days that I wish I could just draw all day but in reality I find myself doing a lot of other things. Drawing is just a small part of it. All in all it is fun that it's not doing the same thing every day but I am trying to spend more hours drawing. The ultimate role of multi-tasking! Working as a freelance illustrator seems like a luxury lifestyle, however it can be hard to get out of sync. Do you have any habits that keep you on track and motivated? What always motivates me is that I can make a tiny difference in my own way. I try to think that every day with my work. I would love to make a difference for people with little jokes, making them smile or chuckle, or showing people a different perspective on things. In the end it's all about the message behind the illustration for me, even though people might not notice it directly. I hope to strike a chord with people, that's what keeps me on track and motivated. …And are there any habits that you would love to break?! I wish I could shake off the feeling I have to produce something every day. If I don't work every day, I feel guilty quite easily. I'm quite bad at taking days off and treat myself to some rest. What is your studio environment like? (We have seen some sneaky pics of it on Insta hehe). And if you were to have any studio space in the world, where would it be and what would it be like? Unfortunately, I'm leaving my studio soon but I also work from home, in a little nook in my bedroom. I've made it really nice and cosy, with inspiring illustrations on the wall. I think it's important to create a little space of your own that feels comfortable. I usually draw on my dining table because it has the best light in the house! I'll be moving to a new house by the end of the year and I will most definitely make sure I have a space there too that feels comfortable and artsy. I need that to feel inspired. It's also going to be a whole room instead of a nook so I can't wait to make it my own! If I could choose I would not pick one place, but I would love to be travelling and drawing what I see and encounter. Collect stories from all over the world. I travel a lot through the UK and I always find it inspiring! The variety of new places is what keeps me motivated to create new things and tell stories. Travelling and capturing the world is something I dream of! Isn’t “nook” just a fab word?! What is your process of creating an illustration? Do you draw a quick sketch and then the main image, or draw everything in one sitting? When I make my comics I usually jot down ideas on my phone and after they've been there for a while I go back to them to see if they still make sense and if they're funny. If so, I make sketches of how I want to tell the joke. Then I redo them with inks and colour them digitally. With illustrations the process is a bit different as I often do that for clients. It usually starts with a small thumbnail, deciding on the composition and colours. If that's ready I start working on the final piece, and I love to mix gouache with pencils and digital colouring. I love working with deadlines and clients though, always have. I like working together with people and creating something visually that captures what they have in their heads but couldn't translate to paper. It's more difficult but the challenge keeps me on edge. Making an illustration whether it’s for me or for a client can take a few hours but it can also take a few days. Your card range features little notes into everyday life, with habits of cosying up on the sofa and watching Netflix, would you call yourself an introvert or merely someone who enjoys the home? I never realised I was until someone mentioned two years ago to me "you must be an introvert". I googled it and I had to admit: that's pretty much me. I enjoy alone-time very much and I don't like parties or crowded places at all. It's not that I don't like people: I enjoy one-on-one conversations a lot, and I'm fascinated by how people act and think. I love listening, and I enjoy talking and sharing. But I have to moderate it and recharge myself often by being alone. Alone time is golden! Who/what are the most inspirational things that you find around you? Is it conversations with friends or the wonderful power of social media? It's in the really small, daily things. Overhearing a conversation in the supermarket, random conversations with strangers in the street (for some reason that happens a lot to me) and nice conversations with friends. I love observing others. Just sitting on a bench in the park observing what's going on around me. Some simple but nice questions…. Panda bear! I love that they eat bamboo because that's always close by and they are too lazy to look for other food. What do you find to be the coolest plant? I'm so terrible with plants, this is difficult! Maybe any kind of cactus? Because no matter how you treat them they usually survive. A bit boring but I love a good graphite pencil! It's an underrated tool but it's so versatile. We should appreciate it more! I love singer-songwriter music the best. I love it when an artist has a message to tell, and you can feel the emotions in a song. It gives me goosebumps! And finally, what is your favorite card in your Ohh Deer range?! Oooh, I have to think… It's the 'Go Hard Or Go Home' one. It still makes me chuckle. Is that allowed with your own work? 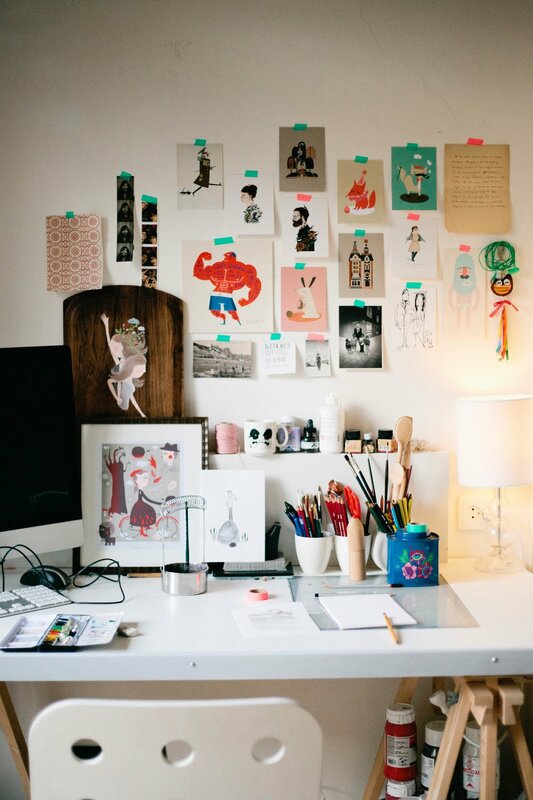 You can follow Marloes on Instagram @marloesdevee and check out her swanky new card range on ohhdeer.com!